It was a sweet few days for The Kids at Silverdocs. And not just because we came away from it with a Special Jury Prize in the feature docs competition. The first screening was Lucy’s first time seeing the film with an audience, and the first time she took part in a Q&A. Since she’s been away most of the past year studying abroad in Buenos Aires, we haven’t talked much about the film, either. Partly by design but mostly following Lucy’s lead. She hasn’t really wanted to talk much about it. So, needless to say, I was more than a bit nervous about what her reaction would be. Not so much about the film itself, but in seeing herself up on the big screen in front of strangers. As she later admitted, the first Q&A (above) was hard. She looked a bit shell-shocked and her answers were pretty brief and general. But by the time of the second screening two days later, she’d had time to think about it and talk to other filmmakers and filmgoers she met while hanging out. At that Q&A, Lucy was poised and articulate. She said that it’s been almost 3 years from the filming and she feels like it’s almost another person she’s watching up there. And that it’s a good film and she’s glad she’ll have this portrait of herself and her family to look back on in the years ahead. Hopefully no one heard my loud sigh of relief while she said it. I wish I could have seen more of the great docs screening there (though I’ve seen a lot from my Full Frame jury duty and from the weekly Stranger Than Fiction screenings here in NYC). I would have especially liked to see Marwencol, which I’ve heard such great things about, and Wo Ai Ni Mommy, the eventual Grand Jury Prize winner. But I was mostly tending to my two stars. Marjorie I knew would have a great time, she almost always does at the festivals she attends. 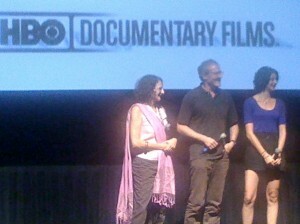 But Lucy was the wild card, and she seemed to really enjoy the whole Silverdocs experience. Hopefully, the week marks a new beginning of my ability to write more frequently and candidly about the film. It’s one thing as a director to be protective of his “star”. But as a father, I needed to know my daughter was really okay about the film before I could move forward and talk about it in depth. So, many thanks to Sky Sitney and the Silverdocs staff for a special week. And, of course, the features competition jury for the very special recognition.